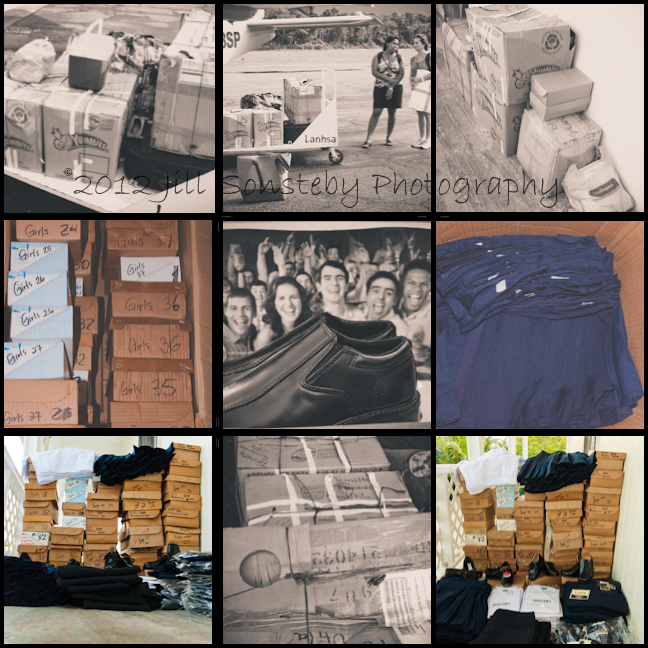 28 shirts. 39 pants. 29 skirts. 27 boys shoes. 24 girls shoes. Perfect. So we fly over to La Ceiba with our friend, Angelo of Island Air and arrive around 9 am. We spent the day with two of our friends, running errands and grocery shopping for things we just can’t get on Utila. We hire one taxi driver (who we know will give us a good price) and he takes us to the places we want to go and stays with the car as we pile our goods in the trunk. 3 pm rolls around and we make our way to the airport where we are meeting up with our friend, Toinette. Toinette is our new-found friend and the teacher we have worked with at the public school. She was in La Ceiba attending school (studying to get her Master’s Degree) and she offered to go to the local stores to get all the uniforms ordered. She succeeded in getting all the uniform items! We all arrived at the airport on time and were soon on the tarmac waiting to board the plane. All of a sudden, a group of men approached Angelo and told him that the Utila airport was closed down due to an abandoned plane. I immediately thought we would be stuck in La Ceiba for the night, because nothing is done fast in Honduras. Sure enough we ended having to stay the night in La Ceiba. We slept in our clothes, had to keep contacts in and thankfully we found a store with toothbrushes and toothpaste. Thursday morning half of us decided to take the ferry instead of waiting for the airport to open, to make sure we got home before another day had passed. Finally home and we now have 3 large boxes in our room full of uniform items ( 28 shirts, 39 pants, 29 skirts, 27 boys shoes and 24 girls shoes). Next week, Jeanne and I will wash all clothing items to make sure no resale of the uniforms, then we will put items in a bag for each recipient and attach a tag with their name and a Bible verse. This has been a labor of love and we are grateful that we are a part of these kids lives. We are also so grateful for everyone who has also given to see these kids have what they need to attend school. Stay tuned for more pictures next week when we deliver the uniforms to the kids! 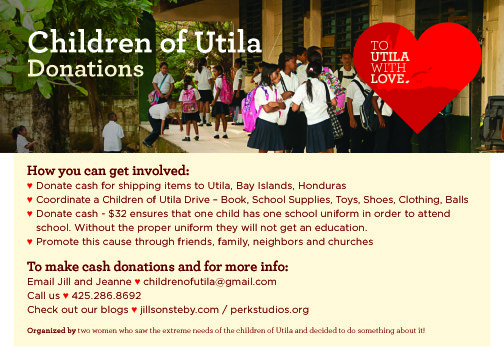 If you’d like more information on getting involved with Children of Utila, please contact us at childrenofutila @ gmail.com. ← One life at a time.